So I decided to try it, but with Butternut Squash instead, because I had some around. 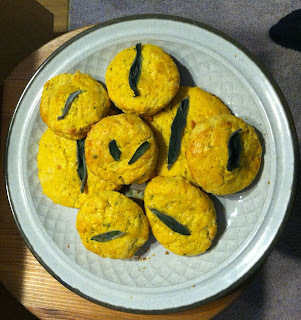 This recipe had been adapted from a recipe for Sweet Potato Biscuits (pg. 109 by Austin and Ashlyn Sailsbury) from the cookbook The Kinfolk Table. Slice the butternut squash in half, lengthwise. Remove all the seeds. 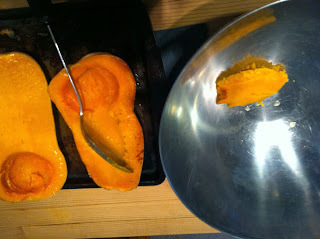 Place the squash halves cut-side facing down on a baking sheet. I cooked two squashes and had way to much. You probably only need about 1/2 a squash for this recipe, but the rest could be used for other things, or just eaten plain. Roast in a 400F oven for about 30 minutes or until a knife pierces the flesh like soft butter. It took about 50 minutes at 400 in my oven. Remove from the oven and allow to cool a bit. Scoop out the roasted flesh and discard the skins. Mash by hand with a potato masher, or if you wish, purée with a hand blender until smooth. Measure out 1/2 cup of squash purée. Chill the purée in the fridge. I did the roasting and chilling the night before. It will take some time for the piping hot butternut squash to cool. 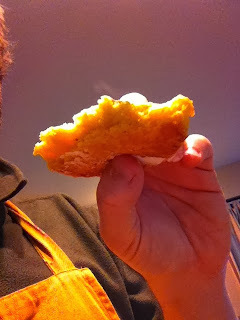 In a medium bowl, whisk the flour, sugar, salt, baking powder, and baking soda. Place this mixture in the freezer while you prepare the wet ingredients (about 5 to 10 minutes). In another bowl, mix the chilled cream, squash purée, and finely chopped sage. Whisk together until smooth. In another smaller bowl, make the egg wash by beating the egg and 1 Tbsp. of milk together. Remove the dry ingredients from the freezer. With a pastry cutter or your hands, make sure the grated butter is fully incorporated into the flour (it should look like bread crumbs). 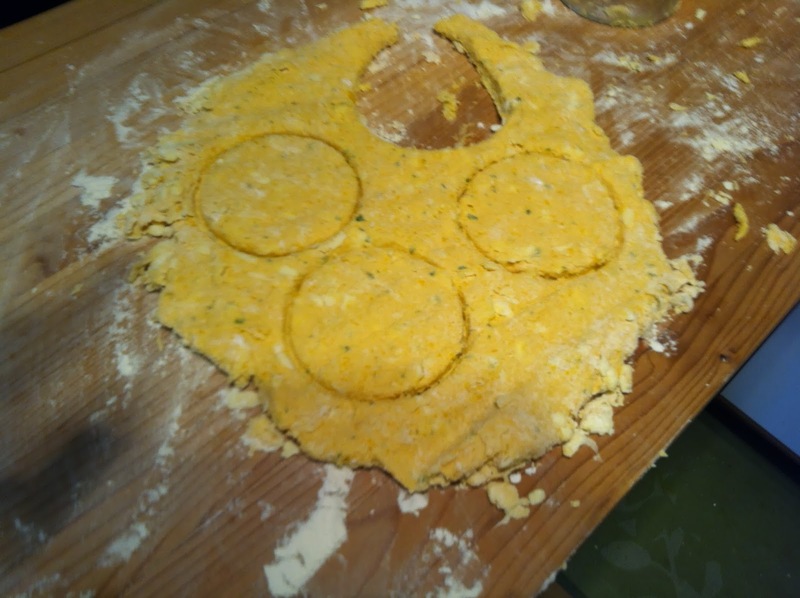 Below is a picture of the dry ingredients with butter, the squash/cream/sage mixture and the egg wash.
Gently add the squash and cream mixture to the dry ingredients, stirring just until the dough starts to come together. It looked very flaky at first, but came together with some kneading. Using your hands, lightly knead the dough in the bowl, until uniform, but avoiding over-handling it. Lightly dust a clean work surface with flour and either roll or simply press the dough out to 3/4 inch thickness. I didn't have a rolling pin which would have been really helpful. Try not to touch the dough too much as it is good to keep the dough cold. Using a 2 1/2 inch round or square cookie cutter, cut out the biscuits. I used cups. The smaller white one worked better. I also think that I could have let my dough be thicker. I think mine was about a 1/2 inch rather then 3/4 inch. Brush the tops with egg wash and gently press a whole sage leaf on top of each biscuit. 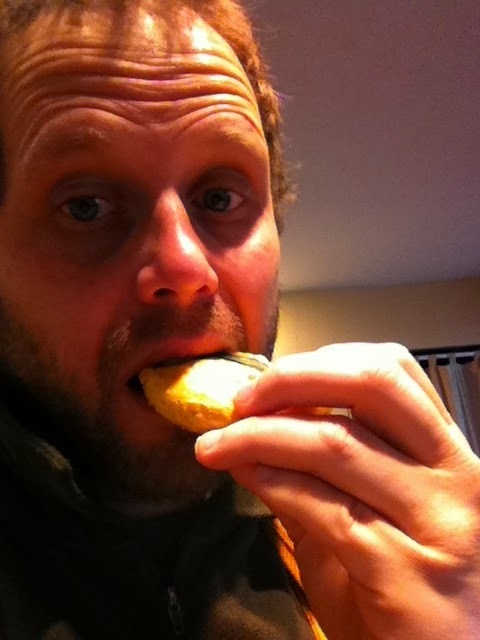 I couldn't find a brush, so I just spooned egg wash unto each biscuit. Place on a lightly buttered baking sheet. Bake for 12 to 15 minutes in a 400F oven, until golden on top. Transfer the biscuits to a cooling rack and serve warm.